Beijing embodies the beating heart of China, brimming with massive monuments to a storied past and robust economic centers. Witness two of its cultural treasures this morning. In the massive Tiananmen Square (meaning “Gate of Heavenly Peace”), the epicenter of ancient and modern Chinese history, view the exterior of Mao Zedong’s mausoleum. You will also see the tower that marks the northern edge of the square; built in 1417, this was long the stage from which new emperors were declared. Then, tour the nearly 1,000 buildings of the Forbidden City, a UNESCO World Heritage Site and accessible only to emperors and their families and court for 500 years. Walk its grounds among the opulent palaces, pavilions, courtyards and imperial gardens within the 26-foot-high walls. Experience one of the world’s most iconic sites today. Travel to the Badaling Hills to behold one of the most impressive and best preserved sections of the Great Wall of China. Built and maintained between the 5th century BC and the 16th century AD to keep barbarian nomads out of the empire, this UNESCO World Heritage Site of sandstone and earthwork stretches some 4,000 miles. Explore its winding pathways and marvel at the panoramic views from its ramparts. 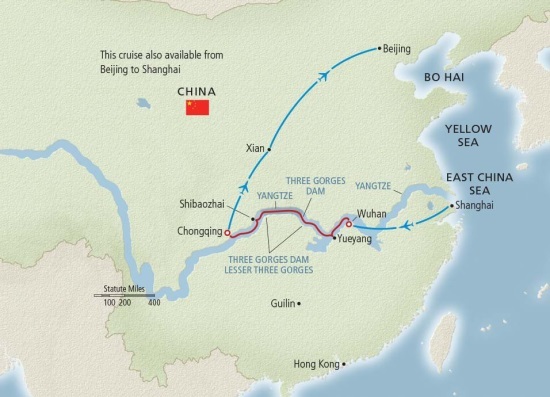 Viking deepens your understanding of China’s imperial history and forward-thinking modernity on one wide-ranging cruisetour. Trace timeworn steps along the Great Wall. Marvel at 8,000 ancient Terra Cotta Warriors, each distinctly carved. Admire emerald-draped cliff faces and hushed monasteries during a tranquil Yangtze river cruise. Step inside the massive Three Gorges Dam. And gaze upon Shanghai’s cutting-edge skyline. Join us on this most enlightening of journeys. Uncover the mysteries of Beijing, China’s cultural and political center. One of history’s great capitals and home to seven UNESCO World Heritage Sites, it is a multilayered city offering a staggering blend of China’s ancient history and bold future.